Today I am babysitting my friends 3 kids 6 and under. The youngst is only 18 months so I have been jumping up a lot as the silent little dude gets into stuff in the first half an hour I found him just about playing in the toilet (bathroom door shut now on) in my front closet, opening the tv glass doors (found childproof lock) and was he eating a toy? Nope! Phew you forget how much these toddlers get into! Currently they are all playing so nicely and I am not going to mess with that so I thought I would quickly blog! Today I have a card to share that I used the other flower stamp from the Floral Blossom set by Hero Arts for Basic grey, I also used a Konnichiwa paper with it! I entered this card last night in the flickr group for March's Hero Arts contest of fabulous flowers! 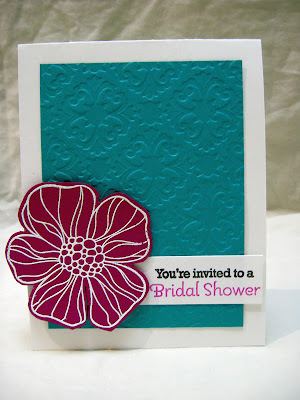 I am also entering this card into Lily Pad's challenge of Flowers, and Simon Says Stamps anything goes challenge! I embossed the flowers with some chestnut zing powder onto the Konnichiwa patterned paper and than embossed them again onto matching cardstock cut them out and paper pieced them, using foam squares to give dimension! My last several cards have been more springy and pink colors this color scheme is a welcome change, it looks so great on my craft table, I keep looking at it! Well this post has been written here and there all morning as I have taken care of the kiddies! Lunch is all ready to be eaten but needs to cool down! :> Hope you have a great weekend ahead of you! Hi! Happy Wednesday! Today was/is a great day! :> This morning Ariel and I went to a friends for a playdate. Us mommies sat in the kitchen enjoying homemade latte's, snacks and fantastic conversation while the kids played quietly really well!! Bliss! I love my friends! Carter stayed home with Chad as his eyes aren't 100% better yet, they are doing better still red but not as red. Chad had a good morning too since not only did he have some daddy time with Carter one of his pals came over while his wife and kids were with us. The day got even better when on the way home since I was in the area I stopped in on one of my favorite kids clothing stores and discovered that Ariel still fits there clothes! Such great clothes and shopping for kids clothes makes me happy! :> Than I stopped in at my LSS as I had to pick up some cardstock and got a few things! Kids shopping and crafty shopping, could it get better? I also finally thought up the rest of this card on the drive. Do you ever do that? 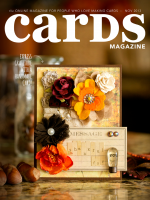 Think about crafting during your day? It had been sitting half finished and cut up for about a week! Coming home and crafting made the day even better! Friends and creating really makes for one happy day! This card has been removed for publication! 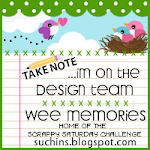 And the Lily Pad challenge of Flowers, and Simon Says Stamps challenge of anything goes! The spring weather (the snow yesterday never did stay on the ground!) has brought out the organizer, cleaner in me! I threw away a lot of stuff and have decided to put away the snow gear, I can always pull it back out if need be it's too much spring jackets and all the winter stuff in one closet! Feels so good but do you ever find that once you start it's hard to stop you could go on and on and forget to feed your kids dinner? Well I am off to spend the evening with the kids. They are enjoying coloring and crafting together right now! :> Love it when they play together so nicely! Happy Tuesday! Hope your day is great! Woke up to rain, apparently it rained hard and hailed very early this morning! And late this afternoon that light rain turned to snow! It's not sticking to the ground...yet! 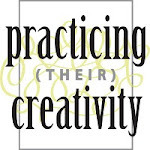 I wanted to mention at the top of my blog just under the header I put a new page of Other Projects with links to projects that aren't cards, like the treats I make for Ariel's class, handmade gifts, birthday parties I did for the kids. I did it to make it easier to check out and be inspired! Today I have a card to share using new stamps and new papers from the Plumeria collection by Basic Grey and Hero Arts! I got this stamp set Pattern Hearts and Flowers for the flowers so I find it funny that the first card I made was with the stamp stamps! :> Pretty simple card stamping, cutting and a little paper piecing but to me it's so spring! Love this Plumeria paper! Do you ever work your way up using your least favorite paper first since you can't cut into your favorite? Spring break has had a good start here. Ariel had a playdate with a class mate yesterday afternoon, the two had so much fun. I love having playdates and helping my daughter grow good friendships! Than she went for a sleepover with her girl cousins at grandmas and grandpas! We met up with my nephew who is Carter's age and they had a fun playdate at McD's! Today Ariel went to a birthday party for the day for one of her good friends! Sadly Carter woke up with red eyes and the skin around all red no goop or liquid coming out. Not sure what it is! An eye infection? He has never had any problems with his eyes before and I remember when I had pink eye the doctor telling me that Poly Sporn eye drops will work if you've never had an eye infection before so I bought some of that and have been using that. It's helping. It almost looks like allergies really bad but he has never had this before so I don't know! Hopefully it's A LOT better tomorrow! Well until next time! I finished the wreath order and am waiting for my friend to take a photo of it on her door the colors will look so great on it! :> See you soon! Hello! Yay the weekend is here! :> And it's the start to our spring break! :> I think this is the first year in a long time that the weather is actually springish during spring break! :> Hope your having a great weekend! Last night I went out with a few friends for pizza and some girl time, it was much appreciated! :> It was also last minute and gotta thank my hubby for changing his plans and stayed home with the kids so I could go out! Today I am working a wreath order, wait till you see it the colors are lovely! Ariel went to a birthday party for a friend and other than that I think we will lay low today! Today I have another card to share using the Floral Blossoms and Zig Zag set. I made this one after my last one you can see it here if you missed it! I loved my last card but I love this one too! 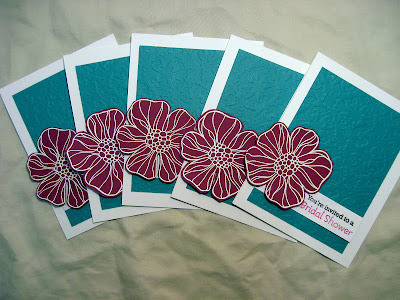 Can't get enough of this flower stamp I have another two card ideas still! I stamped the zig zag background by Hero Arts with pumice stone distress ink by ranger onto white cardstock but inked the stamp with versamark first to give the ink a more crisp impression. Stamped the floral blossom also by HA in moss green pigment ink by colorbox, and in a new ink color I picked up Turquoise gem by versamagic. Cut them out and adhered them, the blue flowers with foam squares. Made a banner out of grey cardstock and white embossed the sentiment from the set Good Friend by HA. Added some bling, I am loving bling right now by the way it adds so much! I was going to do these flowers in pink again but I am so glad I went with the blue! Well I am off gotta get dinner in the slowcooker tonight I am trying a new recipe, Teriyaki chicken! And I gotta get busy making some felt flowers! Hello Happy Wednesday! :> We spent the morning at Stay and Play at my church, I enjoyed chatting with my fellow mommy friends and Carter enjoyed playing! :> I really enjoy stay and play and seeing my friends and I try to find a baby to love on and get my baby fix! I also got a great email that one of my wreaths have been picked up for publication in Create: For the Home! I have only been making these wreaths since Christmas so you can imagine how exciting this is! And thanks to my mother in law for suggesting I try to get a wreath published! I don't know if I would have thought of it! A little bit back when I was sorta not feeling the mojo I embossed this tea flower in chestnut and colored them by using inks and water to paint them! I did a whole bunch and very much enjoyed it! Besides making one bridal shower card I put them aside! The other day I knew I wanted to pair up the dot flower background with the classic tea flower! And here you go! It's been a bit since I've added a card with ribbon so at first I had a bit of difficulty tying this! Oh I also have to share that Carter has really started to love coloring as of lately. Little girls always love to color but not always the case with boys. I try to encourage it because it's good for them to color so that when they go to school they have a better time with writing. Yesterday he started to draw faces with eyes and a smiley mouth! So cute! And today he added bodies! Drew a whole bunch of people! He's so excited and so cute about it! Hello! Happy Monday! We are starting this week with gorgeous temperatures straight from a beautiful weekend! I just can't get over how hot it is! I've been contemplating turning on the a/c how hot it is! When I looked at the forecast for this week I changed my mind as it's cooling down so I better enjoy it while I can! Today I have a card to share with you using some new stamps from Hero Arts Basic Grey Konnichiwa line. When I saw this set I had to have it, love the flowers! I used the gorgeous flowers from the Floral Blossom set by Hero Arts. I love it! I also used one of my favorite backgrounds the zig zag by HA. I stamped the background in raspberry pigment ink by colorbox. Stamped the flowers in moss green pigment ink and cut with my cutter a square and than hand cut the flowers that hang off. Than I stamped the flowers again in the raspberry and cut them out and mounted them with foam dots. Stamped the sentiment from the set Good Friends by HA too. Love this sentiment! Put the whole card together and realized it needed something so I mounted it with some dark chocolate cardstock by PTI. I so enjoyed making this card and love it! I can't wait to play with this stamp again! Well I am off to get dinner ready as the kids have there last skating lesson today! (Even though Ariel isn't feeling all that well she is begging to go!) Looking forward to being done but happy with how well the kids did with it! :> See you soon! Hello! Yay it's the weekend! :> And it's beyond beautiful here! It's supposed to get to plus 26 Celsius here today! Absolutely crazy here in March! :> But we are enjoying it! Last night Chad went out with some guys for a guys night so I invited my girlfriend over with her three girls! We had a nice relaxing evening and the kids had a lot of fun! Today I have a card to share using a new stamp Watch Gears by Hero Arts! I really love this stamp for making masculine cards. This is a card I made for my Father's in laws birthday! Well I am off to go get mud off the kids rain boots! :> It's that time of year! Hello! Happy Tuesday! Hope your day is going great! The weather warmed up this weekend and I thinking Spring may be here! Early for us! You never know last year it snowed on May 1st and no I am not kidding (It did melt the next day though!) On Sunday I had to run out and get Ariel a new spring coat and splash pants! And rain boots for Carter! I didn't mind, I got Ariel the cutest coat and Carter frog rain boots! Ariel still fits last year's boots but I would have bought the lady bug ones if they fit, they just about did, they were so cute I considered getting them anyways but I guess I wouldn't be the best mom if I had her squeeze her feet in them no matter how cute they are! :> The forecast for this week is unbelievable! I don't remember the last time we had a spring like this in March and I am holding my breath that it's here to stay! I stamped the alphabet background by Hero Arts in frost white ink by colorbox onto kraft cardstock and made a tag from it, stamped the sentiment from Sending Smiles by Hero Arts onto the red cardstock strip. Isn't this sentiment perfect for a teacher? Added the punched strip to the bottom. :> I whipped this up pretty quickly but am happy with how it turned out! 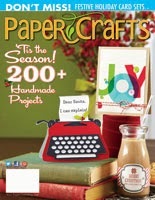 Hello my dear crafty friends! Happy Thursday! :> I want to start this post off by saying a heartfelt thanks for all your kind comments on my last post!!!! Every comment you took time out of your lives made me smile and feel special! Thank you for visiting and leaving me love! Today I want to share with you the bridal shower invites that we made for my brother's fiancee! In total there were 6 of us working on these invites. I invited a few friends and my two friends Sophie and Kate came over to help! (Any of my crafty friend's I've met up with at Scrapfest would know these two girls!) My brother's fiancee Oksana came too and two of her bridesmaids! So thankful for all the help! :> We made 100 invites! It's going to be a big shower that my mom and Oksana's mom is throwing. I realize it's not typical for the mother's to throw the shower but here the Croatian (my side) and Ukrainian (her side) it's quite common. We started around 3:30 and worked on them until about 9:00 I would say, with a dinner break! Oksana and I came up with the design heavily influenced by this card. It was easier to look at cards online and agree on something together. We did simplify it as we had to make 100!!! We went to my LSS together and picked out cardstock together. And picked out the flower stamp together! Chad was able to print the details of the invitation right inside the cardstock which saved a lot of time! We all worked in an assembly line sort of card making! 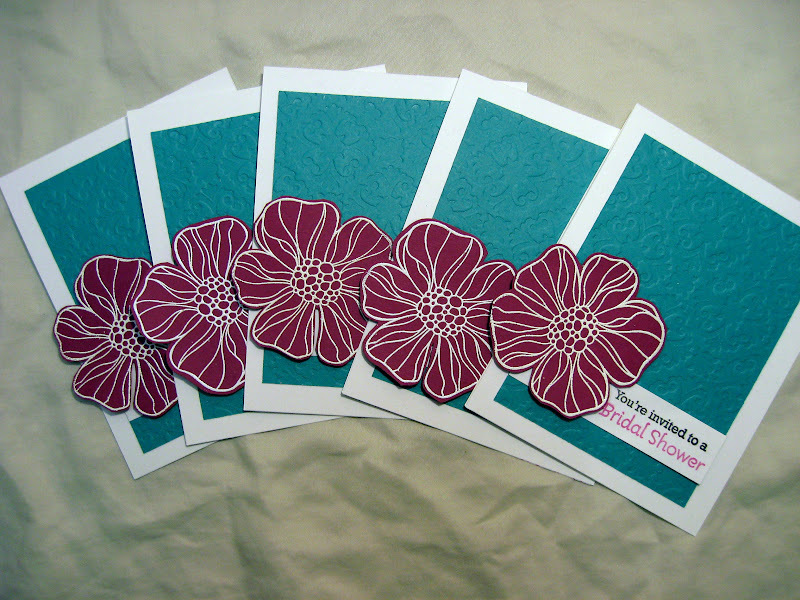 By the way I have two good tips for faster stamping when your stamping 100 flowers like I did! When I was stamping the flowers with versamark I inked the stamp well and stamped the flower and than restamped it without inking it again just with more force and they both "caught" the white embossing powder fine. I basically inked once and twice stamped. Than when I stamped the flower inside the card with lilac posie ink I inked up the flower stamped it and on the next card I huffed on the stamp and stamped it again. Sure it was slightly lighter but it still looked great! Both methods saved a lot of time! Well I am off to work on dinner!!! Hello! Happy Thursday! I am quite excited as tonight I will be going to my first Jets game! Well this season you see the Jets are a NHL Hockey Team! 15 sad years ago the Jets left our city! :< And after a long awaited time our city has an NHL team! I personally think that every bigger city in Canada should have an NHL team as we love hockey here! Hubby and his friends were beyond lucky to get season tickets, I think they sold out in just minutes! He has gone to a few games already this season and it's the first time I am going! I am so excited! When they sing the national anthem the whole arena shouts out True North when those words are sung, as the team is owned by a company called True North! So cool! Apparently even if you don't like hockey you will have a great time with the energy and excitement of the arena! Chad's parents are babysitting the kids and since Ariel doesn't have school tomorrow they are sleeping over!